“The Internet wasn’t broken in 2015, before these Obama-era regulations. It isn’t broken today. In fact, it’s getting faster, cheaper, and better. Democrats want to jeopardize those gains. “When Democrats voted for their so-called ‘Save the Internet Act,’ they didn’t vote to encourage innovation or improve internet access. Instead, they offered their favorite – and indeed their only – policy solution: more government control. “Democrats voted for five unelected bureaucrats to have the power to set prices. They voted to reimpose 700 pages of pen-and-phone regulations. They voted for increased costs, more obscure fees, more taxes, less transparency for consumers, and fewer options, particularly for families in rural communities. They voted for government to dictate how Americans use the Internet. “Under the Democrats’ plan, the Internet would be less free, in every sense of the word. “Republicans have a better plan: keep the Internet tax free, encourage competition, and hold companies accountable that block sites or throttle speeds – all without further centralization and over-regulation. 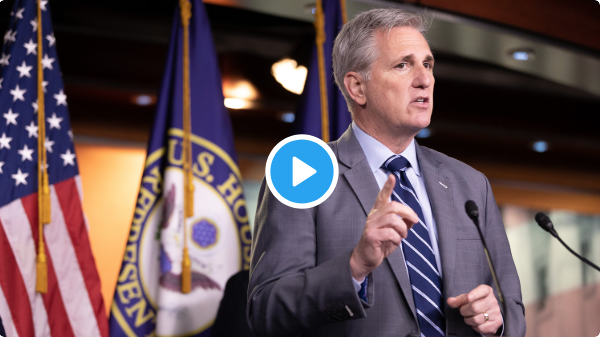 Leader McCarthy also spoke on the Democrats’ plan to takeover the Internet at a weekly House Republican Leadership press conference held Tuesday morning. A key quote is below, or watch online here.